The Courtyard is Block 41’s secret garden. Tucked into the heart of busy Belltown, this secluded outdoor space is private and serene and at the same time energized by the surrounding presence of the city. It is a landscaped garden of delights, from the whimsical “Greetings” mural by graffiti artist Victor Vong to the magically illuminated stainless steel fence created by artist Stephen Hirt. The Courtyard’s 12-foot tall living wall and evergreen landscaping introduce nature into the space creating a welcoming oasis within downtown Seattle. The large ipé wood deck is perfect for banquet seating whether open to the stars or tented. 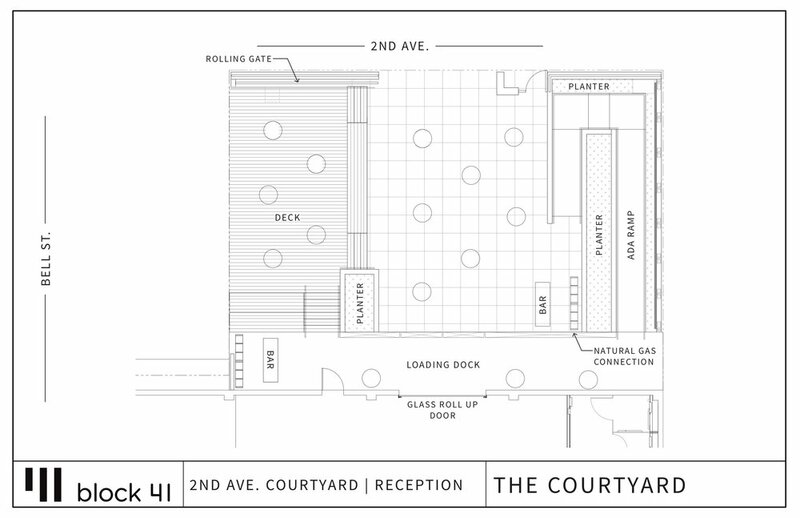 The Bert & Tot Ballroom merges seamlessly with the Courtyard through a large glass roll-up door. PERFECT FOR: Cocktails Under the Stars, Sparkler Send-Offs, Food Trucks and Carts, Concerts, Yard Games, Luncheons, Rehearsal Dinners and More.